Your favorite family memories are yet to happen! Go explore this great continent with the 2019 Forest River Grey Wolf 26DJSE SPECIAL EDITION! It's an amazing Travel Trailer, built for long distance road trips with the family! You can find this model and others from the top RV brands in the nation at Lakeshore RV Center, the #1 RV dealer in Michigan! With our factory-direct prices and exceptional customer service, we've become one of the most popular dealerships in the nation! Even if you don't live near Muskegon, we can utilize our 24/7 nationwide delivery service to bring your dream RV to you! So stop by our location at 4500 E Apple Ave Muskegon Michigan 49442, or give us a call at 231-788-2040 to talk to one of our Grey Wolf experts today! Your RV fun will know no bounds in this reliable camper, which has a manageable hitch weight of 574 lbs, ship weight of 4596 lbs, and GVWR of 7574 lbs. You can place your camping chairs and picnic table under the shade and protection of the 15' 0" awning! 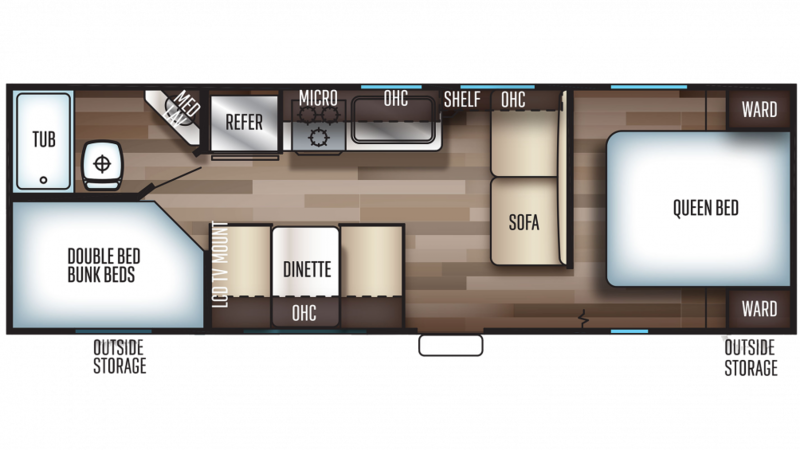 There's ample room to stretch inside this 29' 2" long, 8' 1" wide RV! With slides, the interior is even more spacious! The RV is 10' 6" high, so you won't have to worry about bumping your head! With the 13500 BTU a/c and the 20000 BTU furnace, you can maintain a stable temperature inside no matter what the weather looks like! Sleep up to 9 people with this spacious Forest River Grey Wolf! This Travel Trailer has comfortable furniture perfect for resting after a long day on the road. The cozy Queen bed helps you sleep like royalty and feel rejuvenated all vacation long! This Travel Trailer has a gray water tank that holds up to 38 gallons, and the black water tank holds 28 gallons. The 40 lbs. LP tank capacity ensures hot water in the shower, and there is also a Foot Flush toilet inside the bathroom! Nothing's as distracting as a restless kid on the campground. Thankfully, this Travel Trailer has a bunkhouse with comfy Bunkbeds, so your children won't miss any sleep!